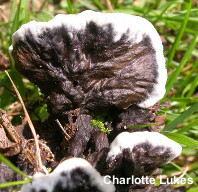 Thelephora cuticularis looks and acts more like a species of Stereum (see for example Stereum ostrea) than a species of Thelephora: it usually grows from wood, and it tends to create clearly separated, fan-shaped caps. Typical Thelephora species are terrestrial and develop confluent, less-easily defined caps. Under the microscope, Thelephora cuticularis stands out like a sore thumb. It is one of only a few Thelephora species that lacks clamp connections—and its subhymenium turns dramatically greenish blue to blue in KOH. Like many other species in the genus it features odd, sparsely spiny spores and exceptionally long basidia. Thanks to Charlotte Lukes for collecting, documenting, and preserving a collection of Thelephora cuticularis for study; her collection is deposited in The Herbarium of Michael Kuo. 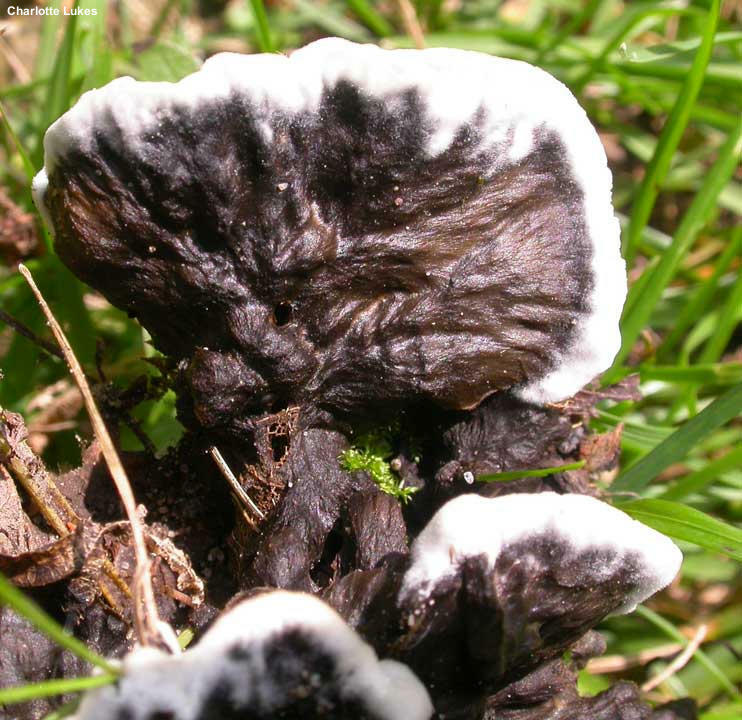 Ecology: Ecological role uncertain; most species of Thelephora are assumed to be mycorrhizal, but Thelephora cuticularis grows from wood and woody debris and may therefore be saprobic; scattered to gregarious or in shelving groups; associated with oaks and other hardwoods, often appearing on mossy bark; widely distributed in North America east of the Great Plains, and documented in Arizona. The illustrated and described collection is from Wisconsin. 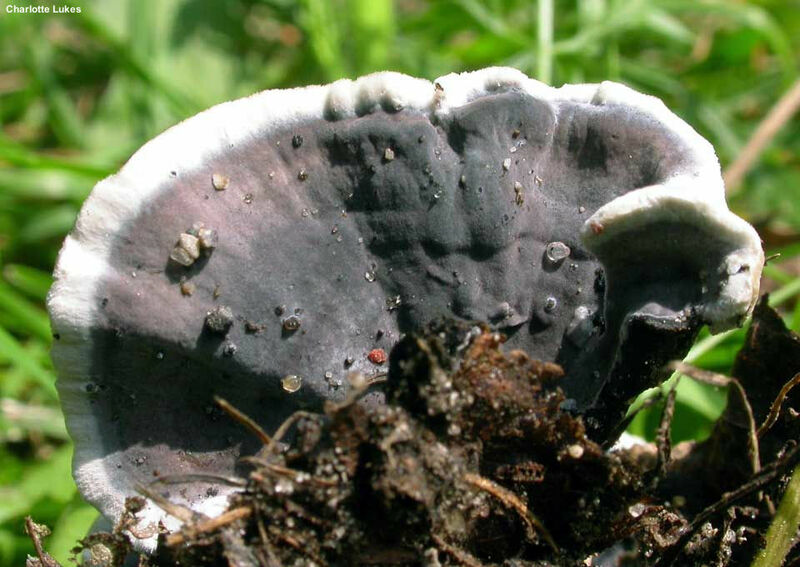 Fruiting Body: A cap-like structure attached laterally to the substrate without a true stem—or sometimes merely effused-reflexed (a folded-over, cap-like edge above a fertile surface that lies flush with the substrate). Cap: 1–3 cm across; 1–2 cm deep; irregularly fan-shaped to semicircular; becoming radially wrinkled; dry; bald or fibrillose; dark brown to nearly black overall, with a soft, white margin. Undersurface: Smooth; dark brown to blackish, with a hint of purple. Flesh: Tough; 2–3 mm thick; brown to black. Spore Print: Not documented; probably brown. 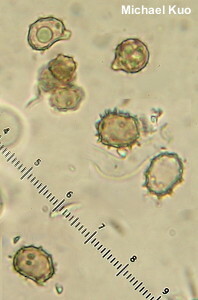 Microscopic Features: Spores 8–10 x 5–8 µm (excluding ornamentation); irregular and angular; covered with spines that extend about 0.5 µm; brownish in KOH. Basidia 4-sterigmate; to about 65 x 12.5 µm. Subhymenium bluing in KOH. Tramal hyphae cylindric; 4–6 µm wide; thick-walled, smooth, and brownish to brown in KOH; without clamps at septa. REFERENCES: Berkeley, 1847. (Coker, 1921; Corner, 1968; Stalpers, 1993.) Herb. Kuo 10231606.